Knee joint pain treatment aims to reduce pain, instability, swelling and weakness. Some treatments work well in the initial stages after a knee injury whereas some are more appropriate for longer term conditions. Here you will find an overview of ten of the best knee joint pain treatments that can help as well as how to use them safely and effectively to get the best results. To be effective, treatment should look to cure not just the symptoms of the problem but also what is causing it in the first place, otherwise the problem may well return in the future. For example, the symptoms you are suffering from may be pain and inflammation but the actual cause may be weakness or instability. Please remember, you should always consult your doctor with any new incidence of pain to ensure you are getting the best treatment for you and that you aren't at risk of further injury. The best knee joint pain treatment to start with if you have an injury is PRICE (Protect, Rest, Ice, Compress, Elevate), previously known as RICE. This helps to protect against further injury, reduces pain and swelling and speeds up healing. Check out the PRICE section to find out more about this different elements of PRICE and how to use it safely and effectively. Strengthening the leg muscles is one of the best all-round knee joint pain treatment options. 99.9% of the time, muscle weakness is a key cause of knee problems. When there is muscle weakness, more force goes through the joint which can lead to long term problems or injuries. Strengthening exercises improve how the knee functions by working on the strength and stability of the knee and will help virtually all causes of knee pain. Visit the strengthening exercises section to find a whole range of exercises from beginners to advanced, including easy to follow pictures and videos. Tight muscles is a common cause of knee pain as they can make subtle changes to how the forces go through different parts of the joint. By doing stretches as part of your knee treatment plan, you can reduce the tension on your joint. Not sure if your muscles are tight? In the leg stretches section you will find simple tests you can do to see if your muscles are indeed tight and would therefore benefit from stretches. You can also find out how to stretch the different leg muscles, quadriceps, hamstrings, glutes, calves and ITB, and how to get the maximum benefit for the minimum effort when stretching. Medications are one of the most commonly used tools for knee joint pain treatment. Drugs such as Tylenol/paracetamol can help reduce pain, and NSAIDS (non-steroidal anti-inflammatory drugs), e.g. Advil/Ibuprofen can help reduce swelling. Always consult your doctor before taking any medications. Ice plays a really important part in knee joint pain treatment in the initial stages after an injury or for long term problems. It reduces the blood flow to the area so limits the internal bleeding which reduces the associated swelling and pain. There are a number of different ways to apply ice, from specially designed ice bags to instant ice packs, visit the ice wrap section to find the best one for you. Also visit the Ice section to find out how to use ice effectively and safely, including how to avoid ice burns. Heat is a great natural knee joint pain treatment for longer term knee problems such as arthritis rather than after initial injuries. Heat works in two ways. Firstly, it increases the blood flow to the area which helps bring in fresh blood, oxygen and nutrients to aid healing. Secondly, the heat reduces the pain sensations and helps the muscles to relax. The best way to apply heat is to use either a microwaveable wheat bag, or a hot water bottle (with a cover or wrapped in a towel). Use for approximately twenty minutes at a time. Safety Advice: Do not use heat if your sensation is reduced or if there is any swelling, and make sure there are enough layers between the heat source and your skin to prevent burns. Braces are a great way to provide support and protect the joint, reduce pain and inflammation, retain heat and promote healing. Using a brace can make sports and day-to-day activities much easier. There are so many different styles of brace out there it can be hard to know what to go for. In the brace section, we cover a whole range of braces, different styles, protection levels and the top five manufacturers. You can read reviews from customers and find out about the pros and cons of each style. 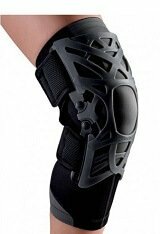 Visit the knee brace section for help finding the right brace for you. 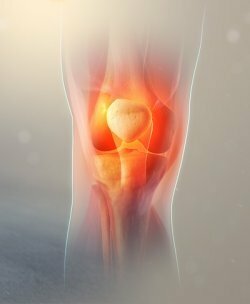 Injections can be a helpful knee joint pain treatment, usually for longer term problems such as cartilage tears and arthritis. Corticosteroid Injections: contain a mix of steroid and local anaesthetic which helps to reduce pain and swelling. Synvisc Injections: increase joint lubrication and can be particularly useful for treating arthritis. You can find out more about how they work, including the risks and benefits of each in the knee injection section. Acupuncture can be really effective way of providing pain relief without having to take pills. 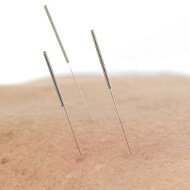 Needles are placed at various points around the body to block pain signals and improve circulation. Studies have shown acupuncture to be a particularly effective knee joint pain treatment for arthritis. It should only be carried out by a fully trained professional acupuncturist. This is a special elastic bandage which provides compression to reduce swelling and provide support. It is cheap, easy to apply and very comfortable. 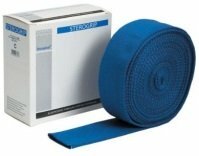 It can be used in both the initial stages after an injury or for longer term problems. Visit the Tubigrip section to find out why it is such an effective knee joint pain treatment, how it works, what size is right for you and where you can buy it from at the best price. Often, these knee joint pain treatments above work brilliantly, but sometime the damage to the joint will require surgery. It may be minor surgery like an arthroscopy or a full blown joint replacement, but the outcome is usually extremely positive. 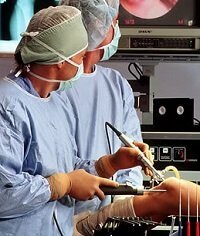 In the knee operations section we look in-depth at the most common types of surgery, such as knee replacements and ACL surgery, who they are appropriate for, what happens during surgery, the recovery process and any common problems encountered. Knee joint pain treatment is most effective when it is started as soon as possible, particularly with an injury, and when done regularly. 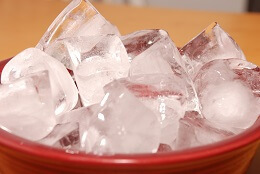 For example, using ice 5-6 times a day is going to produce much better results than only using it once. It can take a while to notice the benefits from knee joint pain treatments as things take time to settle down so it is important to continue with them until things have improved. Soft tissue injuries usually take 6-12 weeks to heal and strengthening muscles often takes 1-2 months of regular exercise to notice the benefits so don't give up too soon. To effectively treat knee problems, it helps to fully understand what is causing the problem in the first place. That way, treatment can be tailored towards you to give you the best pain relief. If you are wanting help working out what is wrong, visit the knee pain diagnosis section for more help.